"The original bulldog was preserved by working class immigrants who brought their working dogs with them to the American South. Small farmers and ranchers used this all-around working dog for many tasks including farm guardians, stock dogs and catch dog. These dogs were not an actual breed as considered by today's standards but were a generic bulldog type. There were no recorded pedigrees or records and breeding decisions were dependent on the best working farm dogs despite breed or background. Several separate strains of the "bulldog" type dogs were kept by ranchers as utilitarian working dogs." "By the end of World War II, however, these bulldog type strains were becoming extinct. Mr. John D. Johnson (pictured left), a returning war veteran, decided to resurrect this breed. He found many of the best specimens of these working type dogs and started recording pedigrees and family trees. His aim was to produce a large farm guardian-type bulldog, reminiscent of the bulldogs of old. Later Alan Scott and several other breeders joined Johnson's efforts to resurrect and recreate the old time bulldogs. Johnson and Scott began to carefully breed American bulldogs, keeping careful records and always with an eye for maintaining the breed's health and working abilities. Initially Johnson and Scott had a similar vision and even traded dogs with each other. However in time there was a split between their visions and resulted in the two distinct types of American Bulldog. Alan Scott preferred a smaller more athletic dog with a longer muzzle that could be used for cattle catching as well as wild boar hunting. John Johnson preferred a larger more massive dog with a shorter muzzle that was more of a guardian type dog. Over time the two founding breeders as well as important breeders crossed in other breeds to help meet their goal of the ideal working bulldog. Originally the breed was called the American Pit Bulldog and in the 1970s registered with the National Kennel Club (NKC) as such. Later the name was changed to American Bulldog to avoid confusion with the American Pit Bull Terrier. The American bulldog was recognized by the United Kennel Club on January 1, 1999. Currently the breed is recognized by the NKC, UKC and the American Bulldog Association (ABA)." Upon all the earth, throughout all the earth's history, only two species have overcome, contained and/or eaten every land animal known to man. We, human beings are one of those species, the dog is the other. It seems more than coincidental that dog and man are also friends unlike any other two species on earth - the two most capable species choosing friendship. Surely both dogs and humans are benefitted by the other, and are found paired together in the art of most all the ancient cultures. 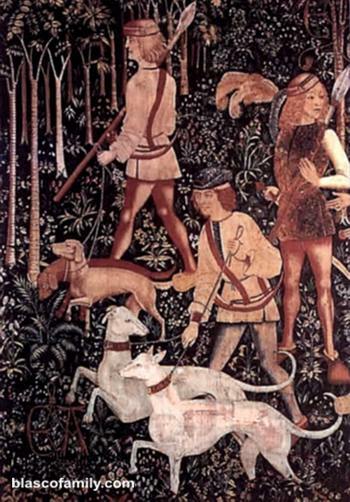 Further, I would argue that we typically see the same few dogs throughout history. To the left, ancient Europeans refined very large, white and dark colored breeds for the purpose of hunting. Pictured, the now extinct Alaunt, descendant of Asiatic Masiffs bred to German Mastiffs and Bullenbeiszers. "The Romans made use of steppe nomads in their cavalry. Marcus Aurelius sent 5,500 Alans to Britian, where they guarded Hadrian's Wall. Their fierce Alaunt dogs went with them." In this plate, I'd like you to notice that while we are looking at a lot of different dogs, most are very large, some significantly larger than the human handlers working with them. With the exception of the two smaller dogs (center) and the Shepherd-like dog (upper right), the other four dogs all clearly have the same head and body type, but of different colors. You could easily correlate the phenotype of the dogs in the picture to that of some modern breeds, yet this plate is well over a thousand years old. Modern breeders might ask themselves here, are they breeding better or worse than the breeders who bred these dogs? In the lower left corner, a progenitor of the American Bulldog, long before arriving in the New World. He is roughly the size of a man, and the same size as what is likely the progenitor of the Neapolitan Mastiff on the far right, only white. The lower jaw is undershot. From it grows two teeth, one on the left, the other on the right, which are only slightly exposed... These dogs have large heads and drooping ears, a strong nape and neck... 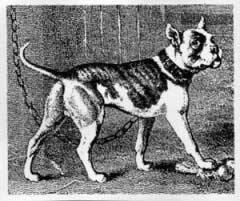 The tail is thick, the bark sonorous, the jaws large; the color usually is white..."
Again looking at the early European dogs to the left we see the very same dogs in our American Bulldog breed today. Note the large, round heads, two white dogs (one splotched with color) and a darker dog between them with a spot on his back. These dogs could easily be litter-mates with each other and a few rare American Bulldogs bred today. Now again, these are clearly Bullmastiff type dogs shown in Europe hunting well over 1,000 years ago. Notice the colors: A pure white dog, a pure brown or red dog and a dog lighter in color with spots and all of the exact same size and type. Breed an American Bulldog to a Bullmastiff and you may well see these same three dogs in the litter. 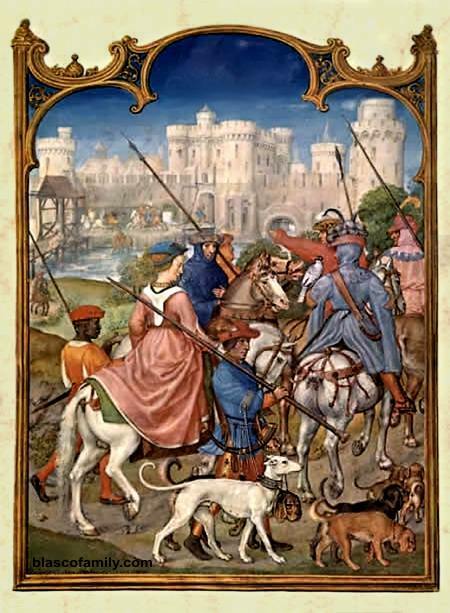 Here a dog almost an exact replica of the Standard, Performance Line or Scott Type American Bulldog in a German painting of 1510. The white dog shown in the forefront - for all practical purposes lives on my back yard today, here depicted as the canine pride of royalty, the centerpiece of the painting - and beside him, a rightfully jealous hound. 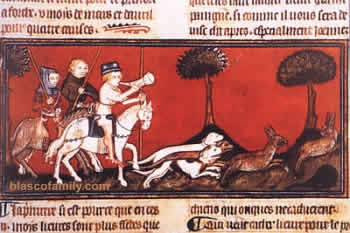 The white dog's master with the long spear is a hunter; notice the horn at his hip, the twine and loops on his arm and waist. 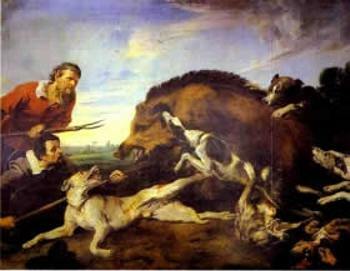 He and his dog are protecting the elites from the the larger game they hope not to find: Wolves, bears, lions, and the centuries famous and feared wild boar. Nothing will screw up a garden party faster - and nothing battles them better than the white dog depicted - proud protector, aloof among the hounds. Note also his wide, metal cut-collar, similar to those used today on hog-dogs, protecting their throats from razor sharp tusks. Some will say he's a Greyhound, to which I reply, at this point in history, they were the same dog. 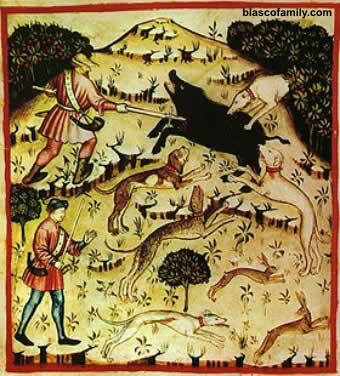 "In his History of Virginia, first published in 1705, Robert Beverly ...says that the hunters always took their 'great dogs,' their mastiffs and greyhounds, with them on these excursions to guard against wolves, bears, panthers, and wildcats." 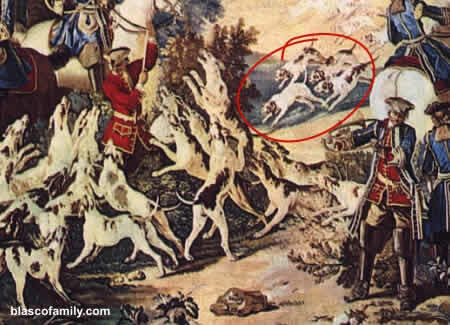 Looking closely we see three distinct dog types featured in the painting: A large Bulldog or Mastiff type breed, showing a large round head, full stop and white underbelly; another large, dog just below him, showing what seems to be a black and tan fur and longer head (a Wolfhound? ); and last, three pure white dogs - two of them very large, but all clearly the same breed, with large, elongated heads. 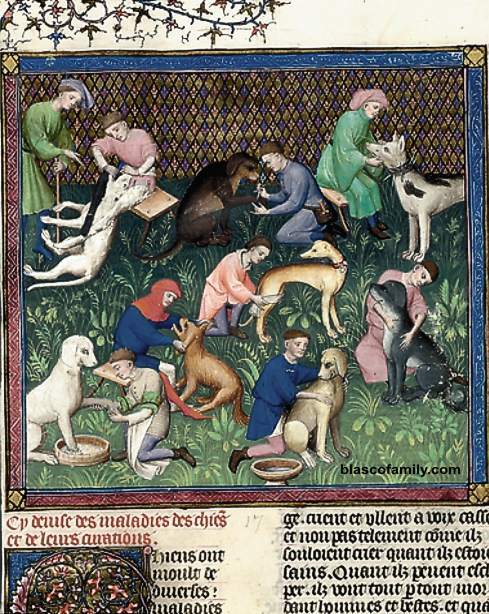 Of the the four dogs interested in the wild boar, all are clearly giant breed dogs, easily the size of today's Mastiffs, but note the absence of fat and hanging skin. Each of the three distinct breeds shown are unquestionably bred to be very large running dogs - including the Mastiff or Bullenbeiszer type dog. White color in the ancient Alaunt allowed it to be seen at night by his master and discerned from prey and livestock. Darker colored dogs on the other hand, provide stealth. Each have their purpose, but both bred for speed and power. This painting by J. F. de Troy hangs in hunting clubs across Great Britain, rightfully demonstrating the long and unbroken history of England's famously capable Fox Hounds. However, look at the group of dogs I've circled. Notice the still very large size, but the slightly shorter legs, shorter, more round, larger heads. There is no question but that these are a type of white Bullmastiff - what we call an American Bulldog today. Interestingly, we see the same dogs pictured here, while between the first period piece to this one, over a thousand years have passed. The American Bulldog is aptly named. Gone is that dog of Europe delivered to us via settlers to the New World. The Alaunt also seems to have had two types, but was much bigger than even our biggest Johnson or Bully Type dogs today, and at least every bit as athletic as our best Performance Line or Standard Type dogs. Clearly, that first image above, of an early American English Bulldog - that which we are so proud to have in large part recreated, that dog doesn't begin to compare to the Alaunt from only a few generations earlier in Europe. John D. Johnson, Alan Scott and many other breeders today, have successfully saved that Bulldog of the 17- and 1800s. We might even argue, he's even in some instances been improved upon. However, what we have left of the Alaunt in the western world is an ever receeding genotype hidden within America's Bulldog. This is where my own interest lays - in how we've saved and improved upon the early American farm dog known simply as a Bulldog, Ole' Southern white or Alabama Bulldog - and how it is still not the Alaunt that it once was. To my mind, this means there's work to do. The American Bulldog is a good place to begin for a westerner, but if you were to ask me what my dogs 20 or 30 years from now might look like, I'd answer with some of the much older images above - and maybe with some photographs of Central Asian Shepherd dogs still around today. For me, to reach the Blasco Family Bulldog© of tomorrow, I must tread back further than just early American history, and see the dog as he was truly meant to be - and wonder at the dogs that made him.